Warm Egg and Potato Salad with Spicy Peanut Sauce is going to take time and effort, but it makes you proud and glad in the end. Made with simple ingredients available in an average home, this salad brings out the best in them. If you want to make something special without going to the market, this may be the perfect recipe. The colorful ingredients are another plus point and encouraging factor. 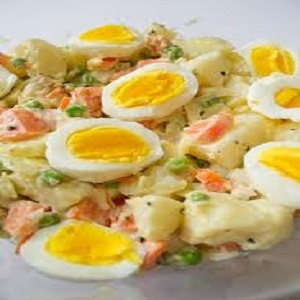 The salad is divided in to four parts; boiling the eggs, cooking the vegetables, preparing the sauce and then mixing them all together to make a delicious whole. The step by step guide below has the perfect detailed recipe that you will be needing to cook. Boil the potatoes in a pan of water with a steamer on top. Cook until they are tender. In the steamer, place the carrots, beans and cauliflower. In another pan, boil the eggs while the vegetables are being cooked. You have to hard boil them so it is going to take around 8 minutes. Take the pan off and drain the water. Let the eggs cool down before peeling. After peeling them, just cut them into quarters length ways. Make the sauce now. In a small pan, heat the sunflower oil and cook the ginger, garlic and chili for a minute. Add the lime juice, sugar, peanut butter and 8 tablespoon water. Mix everything well and cook until steaming hot. When the potatoes are cooked, drain the water and place them in the pan again. Now, mix the potato slices with the vegetables. You can also slice the potatoes if you think baby potatoes are too big for a bite. Sprinkle the olive oil and vinegar over them. Tip these vegetables into a salad bowl and top up by arranging the egg quarters on the top. Drizzle the peanut sauce over it all in the end and serve hot immediately.